1. Always meditate on the Word in preparation for prayer. Don’t listen to those teachers who tell you to clear your mind before you pray, or as a means of prayer, by the method of their mantra. This act will do nothing but bring you into the devils secret den where demons will fill your mind full of lies and temp you with all kinds of evil. Listen to God’s Word instead, which tells us to meditate on His Word day and night (Josh. 1:8). For it is God’s design for us that when we pray we should have our mind and heart full of the Word of God. In fact, meditating on the Word is the first part of prayer; it is how we enter the secret chambers of God, where we listen at His feet and enjoy His presence. But is this really what Christian meditation is? I don’t think so. I don’t see that in scripture. I see in the scriptures that Christian meditation involves delighting in His laws (Ps. 1:2-3), and hiding His Word in our heart (Ps. 119:11), and considering His ways (Ps. 119:15), and in storing up His commands within us (Prov. 2:1). And this requires that we think deeply and prayerfully on His Word. And when we do this we are doing our part to renew our mind. Actually, renewal of the mind has basically two parts to it that we must do at the same time. We must put to death those sinful thoughts and desires by reducing our exposure to sinful things. At the same time we must set our mind on things above by thinking and dwelling on good things, including scripture. Then, when we prayerfully do these two things (by the Holy Spirit’s help), the Holy Spirit renews our mind—that is, He transforms (or changes) our mind into a new mind. 3. Learn how to pray by submitting to the teachings of the Bible on prayer, and by following the best Biblical examples of prayer. The Bible should always be our main textbook on how to pray. Submit to the teachings of the Bible on prayer—especially the teachings of Jesus—and you can’t go wrong. If other books you read on prayer seem different than what the Bible says, don’t trust them. Always check out any teachings with the scriptures to see if they agree (Acts 17:11). Also, if you really want to learn how to pray, follow the examples of others in the Bible who you believe to be godly—especially the prayers of Jesus and Paul and some of the Old Testament saints like Moses, Samuel, Hanna, David, Elijah, and Daniel. 4. When you pray always humbly regard yourself as a created being, and regard God as your Creator. This thought of ourselves and of God will set us apart from the Hindu’s and the Buddhist’s and from those who practice yoga and TM. For they believe that we are all one with God (or with the impersonal force); thus, they arrogantly pray as one who is equal with or one with God. Similarly, many pray in an effort to find their own divinity within themselves. We must never believe any of this rubbish! God is our creator and is far above us. We are and will always be His creation and below Him. Let this thought always be in the forefront of your mind when you pray. 5. When you begin to pray always repent of any known sins. We can never expect our prayers to be heard if there is any willful disobedience to God. Moreover, when we harbor sin we let spiritual darkness into us, and therefore, we give Satan and the demons legal access to dwell in us. But if we submit to God and confess all known sins to Him, then He will give us power over the devil—and when we resist him he will flee from us (Ja. 4:6). 6. Don’t pray as an exercise; pray as a relationship. The Hindus and the Buddhists pray the mantra as an exercise, in order to rid themselves of suffering and to realize their oneness with the universe. As Christians, however, we should never regard prayer as a mere exercise. Prayer to us is a relationship; we pray to a personal God who is our Father and a friend. 7. When you pray always focus on who God is and what He desires of us. Prayer should never be to rid ourselves of suffering, or for any other selfish reason. Prayer should always be focused on achieving the will of God in our lives and giving Him praise. 8. Be alert when you pray; and pray in clear sentences. Don’t regard prayer as a state of being or as being “in the spirit”, etc. Yes, we are to pray in the Spirit, but that doesn’t mean not thinking, and not praying in words. We should regard prayer as a conversation with God. Therefore, when you pray, be alert and talk to Him clearly and directly as to a friend. Then listen to Him as He speaks to you through the Word and through His Spirit. We must be clear in our prayers, not so much for His sake but for ours—so that we know how God’s Spirit is praying through us and leading us in prayer. Also, when we pray alertly and with clear sentences, God will give us confidence in prayer and He will bless us for our effort. This post is an excerpt from my book Joy of Prayer. 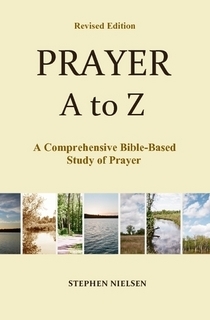 It will also be in my book Prayer A to Z very soon (I’m just finishing up the book–working on an index). This entry was posted in Part 4, How the Devil Tries To Pervert Our Prayers, Prayer A to Z Excerpts, Quietness in Prayer and tagged bible, meditation on the word, prayer. Bookmark the permalink.